The location was quiet and convenient to walk into town. The bed and pillows were very comfortable. The property was clean and well maintained. 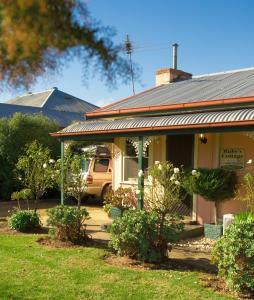 The cottage is located in a quiet street, every room has air-con. The place is really clean and I absolutely loved the white linen and towels. We've noticed the kitchen is well equipped although we were a bit lazy and only boiled eggs in the morning. Very cosy, lots of provisions and had a great sized backyard and outdoor area. Nice shower. A lovely quaint cottage. Heaps of crockery and drinking glasses to try the regions wines. Huge outdoor area which we really enjoyed, & it was well maintained. Wasn't too far to walk to the main shops in Penola (approx. 1 - 1.5kms). 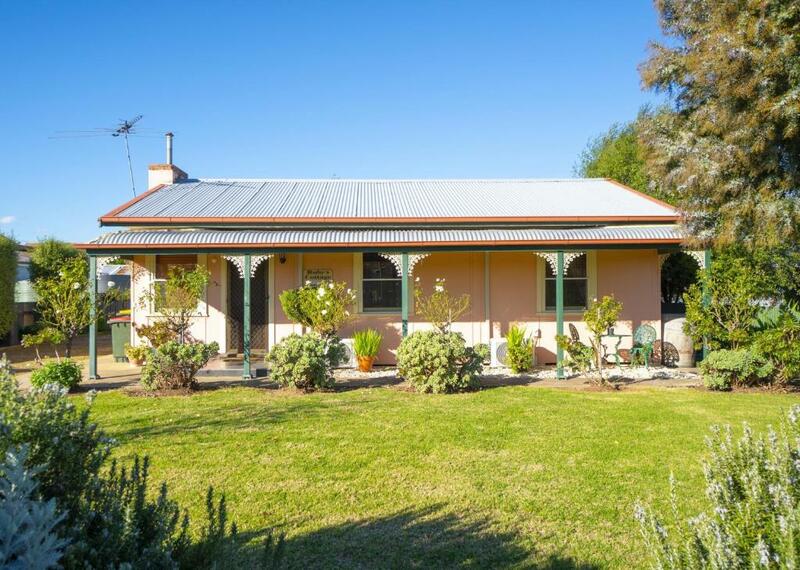 Very convenient to Penola main street. Ruby's Cottage had a well-tended spring garden and is located in a pleasant street. The house was cute and comfortable. Lock in a great price for Ruby's Cottage – rated 8.4 by recent guests! Located in Penola in the South Australia region, Ruby's Cottage features a garden. This holiday home provides air-conditioned accommodations with a terrace. Composed of 2 bedrooms and 1 bathroom, this holiday home has a flat-screen TV and Blu-ray player. The accommodations is equipped with a kitchen with an oven and microwave. A continental breakfast is served every morning at the property. When booking a breakfast included rate, guests will enjoy a complimentary winery walking trail shuttle ticket that gives access to 6 Coonawarra cellar doors. Naracoorte is 29 mi from the holiday home. Mount Gambier Airport is 25 mi away. When would you like to stay at Ruby's Cottage? This holiday home has a washing machine, electric kettle and stovetop. When booking a breakfast included rate, guests will enjoy a complimentary winery walking trail shuttle ticket that gives access to 6 Coonawarra cellar doors. 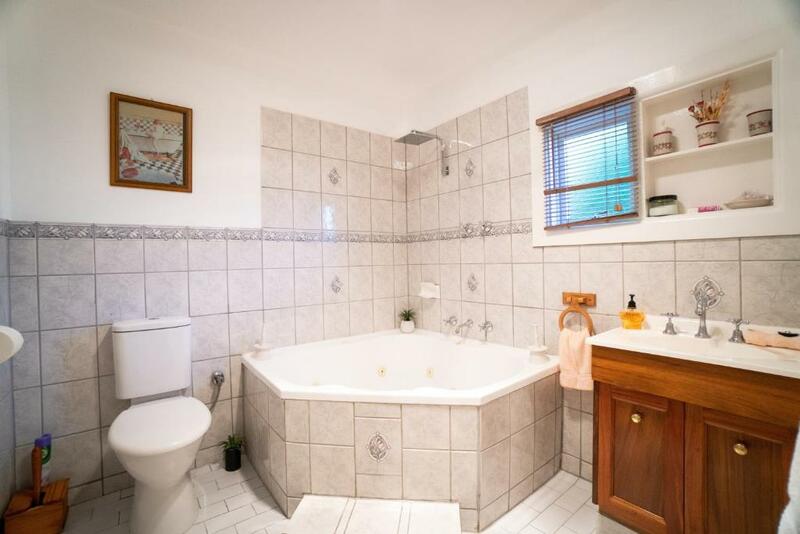 You will not be disappointed when you discover this immaculately presented cottage in a lovely quiet part of Penola yet close enough to stroll out for dinner or a coffee. Situated on a large block surrounded by cottage gardens, your privacy is assured here. You will fall in love with this cottage and its tasteful decoration, absolutely everything has been thought of and provided for. 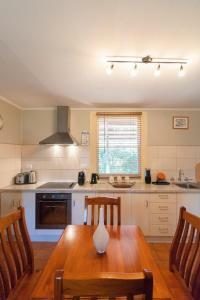 Fully Self Catering including laundry facilities. An ideal retreat with 1 Queen and 1 Double bedroom, Spa bath with shower, BBQ and undercover outdoor setting within a pergola, R/C air and gas look fire. Rate includes full breakfast provisions for first night stay. 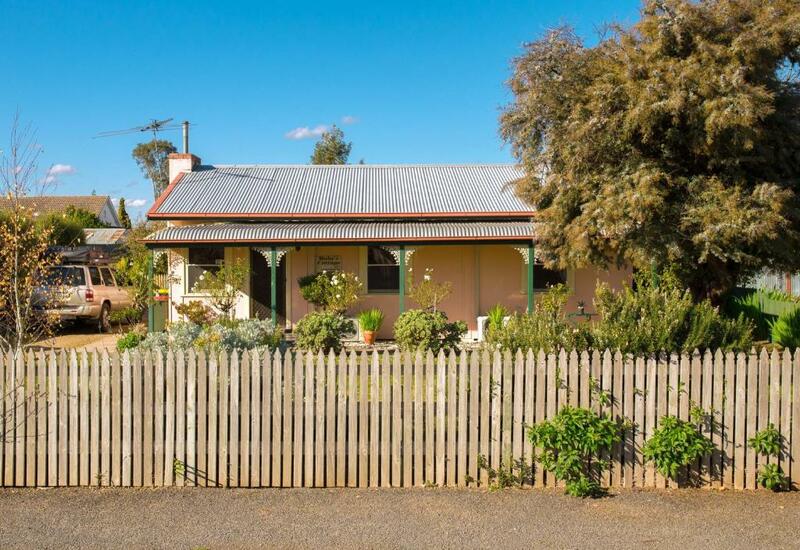 Penola is a town steeped in history with a vibrant community spirit, surrounded by wineries, a short drive from World Heritage features and beautiful beaches. For anyone wishing to find a place where they can relax in comfortable surroundings, indulge in good food and wine while immersing themselves in the culture and heritage of the community, Penola is the perfect place to pause and enjoy it all. So why don’t you stop to eat in one of our many Cafes and Restaurants before shopping your way through our unique shops and galleries, then take a wander along our Heritage Walk to see our many Heritage Listed and National Trust Buildings and Mary MacKillop Interpretive Centre Within a few minutes’ drive down the main strip, there are 20 or more Coonawarra Wineries and Cellar Doors to visit and sample some of the best wines made in Australia.Once you have seen all we can offer, use us as a base and take in one of the many day trips that are just over an hour away. World Heritage Caves & Blue Lake, Piccaninnie Ponds. The beachside towns of Robe, Beachport and Southend. Bool Lagoon and it’s waterbirds. House Rules Ruby's Cottage takes special requests – add in the next step! Debit card Ruby&#39;s Cottage accepts these cards and reserves the right to temporarily hold an amount prior to arrival. Ruby's Cottage accepts these cards and reserves the right to temporarily hold an amount prior to arrival. Please inform Ruby's Cottage of your expected arrival time in advance. You can use the Special Requests box when booking, or contact the property directly using the contact details in your confirmation. In the early evening we tried to have a bath and discovered that there was NO WATER!! When we consulted the Information folder we found nothing to help us. We then phoned the Property Manager who was unapologetic and dismissive of our concerns. The water tanker arrived but had we been out and unavailable to move our car, the driver wouldn't have been able to access the tanks. All useful information to know!! The Property Manager even suggested that we could have 'Climbed up and put a garden hose in the tanks to fill them', had the tanker not arrived!?? We left to have dinner (without a bath or shower and unable to flush the toilet) in town and when we returned there was water once more. A short time later, a neighbour knocked on the door to alert us to the fact that water was flowing from the tanks onto the ground. Once again we needed to call the Property Manager who assured us that the tanks had probably been overfilled and the water should stop soon. Again; useful to know! Most of our checks on the tanks were carried out in darkness by torchlight with water pooling around our feet AND the electric power pump; surely an OH&S issue. We really felt extremely alarmed and inconvenienced by the whole scenario; in no way the relaxing break in our journey that we had been looking forward to. A refund would be appropriate and certainly a review of water supply management to ensure this never happens again. Strong smell of air freshener on arrival - not pleasant. Very fussy decor. Couldn't find instructions for the coffee machine. Plug for bathroom basin almost impossible to remove (had to lever it out with a knife!) A safety rail next to the spa would make negotiating the shower much easier. Plenty of facilities in kitchen. Needs some draught protection around front door for the winter! Being charged an additional$40 after completing our stay. This should have happened before we stayed there! If we had known in advance we would have cancelled. Nice place but won't bother to stay again or recommend to other people! Bed frames are a bit big considering the size of the bedrooms, you have to navigate around them with care. Also the car park is in the sun all day, a roof or a sail across would be great. Hallway was a bit creaky. Although cottage was unlocked, had to call hosts to receive security code for front door - wasn't texted through. Complete lack of communication. Called all three numbers and texted both mobiles with no contact response whatsoever. The property was not ready for us when we arrived. Some Breakfast supplies were missing. Unfortunately the status of the barbecue gas bottle had not been checked (it was empty) and the stovetop/barbecue ignition gun was out of butane. This was a pity as we had invested in an 800g steak and some ribs from the local butcher (who grows his own beef) with all the accessories and were looking forward to enjoying our barbecue meal with some local red. $30 for a gas bottle refill from the local servo made it a more expensive meal than we anticipated! Not a problem for us but you can't close bedroom door in 2nd bedroom without moving bed. We didn't worry about that but if you wanted privacy you might not like that. Wasn't a big deal for us. Very comfortable bed in second bedroom. Great facilities throughout. Coffee machine was great. We arrived late and only there overnight so didn't really use anything. Nice outdoor bbq area.